In the world of hair care there is Philip B., and then there is everyone else! 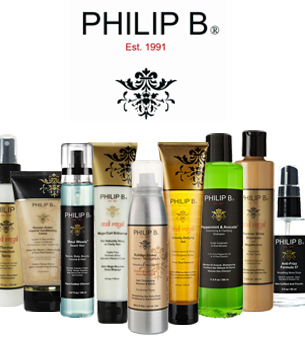 Philip B. has long been known as the preeminent hair care expert for the Hollywood crowd. It all started when Philip B. began his quest for the finest hair care products the world had to offer. This rich line of cutting edge hair care products is packed with all-natural botanical ingredients. Elements of honey, cinnamon, ginger, peppermint, avocado, black tea and cardamom work in synergy to penetrate the hair shaft and revitalize from within. DrSkinSpa.com is an Authorized Retailer of Philip B. All Products are Guaranteed Authentic & Fresh. After searching meticulously through the most well-known and luxurious brands, Philip B became disheartened at the predictable blends of harsh chemicals and cheap ingredients. He knew first hand the power of natural botanicals, and working in his own kitchen, he began to create custom blends packed with powerful treatments elements. My mother told me about DrSkinSpa and said I should talk to the esthetician because I have so many problems with my skin and no matter what I buy, it irritates the skin. The esthetician made some great recommendations and today my skin is all cleared up and much healthier!